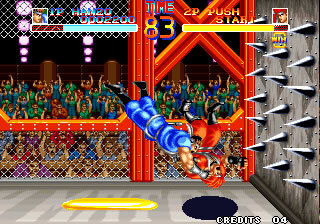 There were a number of beat em ups released around the time of Street Fighter II, some of the better efforts were released by SNK on the Neo Geo. The Neo Geo was the most desirable of the home consoles – promising arcade quality graphics and the like. It was not as well known as the NES or Megadrive, because the games were stupidly expensive: around £149.99 ($200 at the time) for a new game. World Heroes was one of them. 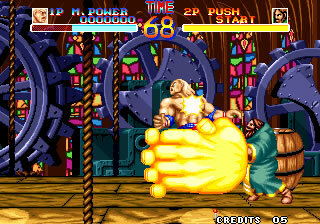 It was probably the most “Street Fighter” game of all of the Neo Geo, created by ADK. The characters included two ninjas with similar moves (Hanzo and Fuuma), a wrestler (M. Power, who looks a lot like Hulk Hogan) and a token female (Janne). There are also two characters with expanding body parts – the monk Rasputin and the German cyborg Brocken. The similarities in terms of characters are scary to Street Fighter II, it’s like the developers said “Lets create similar characters, and then change it”. It’s a fair idea, I mean, the balance between the Street Fighter II characers made it a hit. So how is it different? Well, the game uses a more “Neo-y Geo-y” control system, with 3 buttons instead of 6, one for punch, one for kick, and one for throw. Throwing can be an important part of the game, with a control of type (a number of characters have two throws) and even the direction of your throw. There’s a good reason for it, and that was what set it apart from Street Fighter II. The way in which the game has tried and set itself apart from the rest is the inclusion of “Death Matches”. It’s not in the same league as Mortal Kombat, but what it does include is “traps” on the arena – spikes, oil, mines, fire, electric ropes and the like. Should you hit them, then a sizeable chunk of your energy bar will disappear. Real skill came from “bouncing”, that was throwing the opponant so that they’d land just short of the trap, taking their energy off, before falling back a little further, hitting a trap, then taking further energy off. However, this is the only bit of skill required for the game. It’s a tricky beat-em-up, but lacking the depth and brilliance of Street Fighter II. The storyline of “The best fighters in history” works quite well, and the game refuses to abandon it. However, the characters are a bit cheesy because of it (Janne D’Arc is blatently a rip off of Joan of Arc, and – whilst different levels of punch and kick are achieved by holding down the buttons longer – you don’t feel like there’s any strategy there. The graphcs still hold up okay in a early 90’s 2D beat-em-up fashion, but the music is instantly forgetable. It’s not a bad game, certainly not £150’s worth, but certainly worth a couple of 20p’s in your local arcade on a Saturday Morning. I remember this game in the arcades. I never really got into it because Street Fighter overshadowed it by a mile.